The problem of mobile template not showing a header image will only happen when you have a specific option selected in the "Configure Header" window in Layout section. One solution is to change to another option, the other solution (this only applies when using custom mobile template) is to modify template code. First, let's try to solve the problem by changing the option in the Layout section. Note: To test a custom mobile template in a desktop, all you need to do is to append ?m=1 at the end of your URL. Go to Layout section. Under NavBar gadget, there should be Header gadget. For that gadget, click on Edit link. If you have 1st option selected, your image will not show in the mobile version of your site. If you don’t need to show a title / description in the header, then the solution is simple. Just select either the second or third option. Both of these options shows a header image in the mobile version of your site. But what if you still want to keep option 1 or you want to use different image for a mobile version? In this case, the modification of a template code is necessary and this is discussed next. To keep an option 1 “Behind title and description” and still have a header image in mobile version, we need to modify the template code. This solution only applies to custom mobile template!!!! Note:If you have never edited a template before or you are not sure how to switch your mobile template to custom, check my other post How to modify Desktop / Mobile Template. 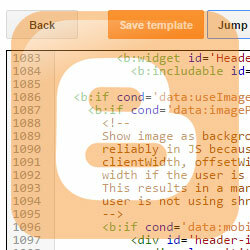 In Dashboard, choose Template section and then click on "Edit HTML" button. Under “Jump to widget" dropdown menu, select Header1. Line <b:includable id='main'> should show up. Expand it the same way by clicking on the arrow besides the line number. After expanding, a lot of template code inside it will get revealed (more than 50 lines). In the code that just expanded, find the first <b:else/> line. Below it, you should find the code same or similar to the one below. This code shows your image, title and description for a desktop version. We need to copy that and put it inside the mobile part of the code. Select and copy those lines from your template. Inside now empty <div id='header-inner'> paste the lines you copied from step 5. This will cause the header image, title and description to show in mobile version same way it does with desktop version. Click on “Save Template” button. YOUR_URL to the URL of your image. You will need to upload your mobile image somewhere on the web. You can use Google Photos for this. IMAGE_ HEIGHT to the height of your image. If the image is not shown properly, modify the CSS background properties to fix them. If you are not familiar with them, check this article for basic information and for more comprehensive tutorial, check here. If you want to keep consistency of your website between desktop and mobile versions in Blogger, you need to use Custom mobile template. If the header is configured, so that the image is shown behind title and description, the image will not be shown in the mobile version. This can be solved in two ways. 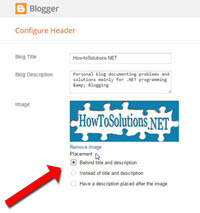 Change the way image is shown regarding title / description or by customizing your blogger template. I hope you found this article helpful. If so, consider dropping a comment or share it on social networks. I found all the code you are referencing in solution 2 but I still cannot get my header imagine to show on my mobile site. Could you please help? Your <div class='header section' id='header' name='Header'> seems to be empty. I'm guessing you are missing the code in the template after <b:if cond='data:mobile'>. Inside it, create <div id='header-inner'></div> and inside that, copy the lines from step 6. This should solve the problem. can't make "Using another image for mobile version of your template" work following your instructions. Thanks for this information really appreciate it.